Elections for United University Professions (UUP), the union representing SUNY professors, concluded on Wednesday, April 10. Once the ballots are counted, the union will announce who will represent faculty and other professionals across SUNY campuses on April 19. For years, UUP elections on the Stony Brook campus have been fairly uncompetitive. But this time around, a group of candidates called the Coalition for Union Reform & Democracy emerged to shake things up. The coalition website says it sees the current chapter taking “a Service Union Approach” where its primary goal is to maintain “a good relationship with the administration.” Instead, the coalition wants to run the union with an “organizing union approach” and defend union members. “We pledge to build a union culture on campus where members feel heard, appreciated, and empowered,” the website read. The current UUP president, Kevin Moriarty, who is running for a re-election told The Statesman he isn’t taking any interviews at this time. Current Vice President for Academics who is running for a re-election, Fred Walter, said it is good to see more people wanting to get involved with the union. He said some of the goals the coalition proposed are the ones the current union has been trying to achieve. Walter said as public employees of the state of New York, union members are constrained by the Taylor Law, which prevents them from striking. Eugene Hammond, who is running against Walter for VP for Academics, said that administrative decisions that were made in the past few years, such as the suspension of the theatre arts major and firing of writing and foreign language program adjuncts, motivated people to take part in the coalition. “I’d like to be part of that push to try to get the focus back on student education, transparency in decisions about student education and transparencies about the [school] budget,” Hammond said. The university has been operating under a hiring freeze since March of last year, citing budgetary constraints that have been questioned by a recent independent report funded by members of the University Senate. President Samuel L Stanley Jr. doubled down on the claim that the school has a budget deficit in his most recent budget message sent to students, faculty and staff. Walter said the budget is not a union issue — it’s a University Senate issue. Although the Senate is more concerned with governance while the union is more focused on terms and conditions of employment, Quinn said the two bodies should work together to put more pressure on the administration. 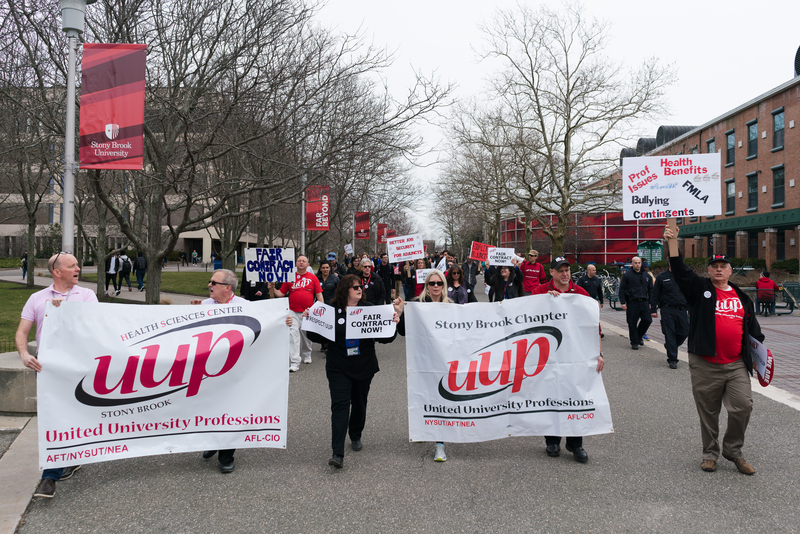 The faculty employment contracts are negotiated statewide in Albany, and last year, the union got its retroactive contract after SUNY-wide union marches and two years after the previous one expired. Any interest in the affairs of the union was hard to find on campus. The Statesman asked more than a dozen professors and union members about their thoughts on this year’s election. All refused to comment, most of them saying they weren’t knowledgeable about the candidates, the union or both. Quinn said one of his union goals, if he was to win the race, would be to involve the Stony Brook Southampton campus more. “I went and visited the campus, and they didn’t know and had no clue that there was any kind of union collection going on,” Quinn said. The coalition tried to involve a diverse group of candidates and did as much campaigning as the could in the time they’ve had, Quinn said. He said the coalition will continue to exist as an independent group of people to provide feedback around campus.